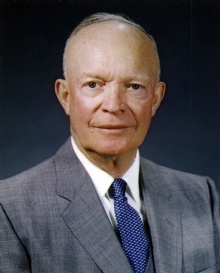 Dwight D. Eisenhower was a famous President from USA, who lived between October 14, 1890 and March 28, 1969. He became 78 years old. Dwight David Eisenhower was a career military officer and politician in the United States for the Republican party. He was the country's 34 president from 1953 to 1961. He is born under the zodiac libra, who is known for Balance, Justice, Truth, Beauty, Perfection. Our collection contains 81 quotes who is written / told by Dwight, under the main topics: History, Leadership, Peace, Society, War. "Leadership: The art of getting someone else to do something you want done because he wants to do it"
"Well, when you come down to it, I don't see that a reporter could do much to a president, do you?" "If a problem cannot be solved, enlarge it"
"If men can develop weapons that are so terrifying as to make the thought of global war include almost a sentence for suicide, you would think that man's intelligence and his comprehension... would include also his ability to find a peaceful solution"
"There's no tragedy in life like the death of a child. Things never get back to the way they were"
"Leadership is the art of getting someone else to do something you want done because he wants to do it"
"There is no person in this room whose basic rights are not involved in any successful defiance to the carrying out of court orders"
"If you want total security, go to prison. There you're fed, clothed, given medical care and so on. The only thing lacking... is freedom"
"In the councils of government, we must guard against the acquisition of unwarranted influence, whether sought or unsought, by the military-industrial complex. The potential for the disastrous rise of misplaced power exists and will persist"
"It is far more important to be able to hit the target than it is to haggle over who makes a weapon or who pulls a trigger"
"Some people wanted champagne and caviar when they should have had beer and hot dogs"
"We will bankrupt ourselves in the vain search for absolute security"
"Politics is a profession; a serious, complicated and, in its true sense, a noble one"
"The United States strongly seeks a lasting agreement for the discontinuance of nuclear weapons tests. We believe that this would be an important step toward reduction of international tensions and would open the way to further agreement on substantial measures of disarmament"
"We seek peace, knowing that peace is the climate of freedom"
"If the United Nations once admits that international disputes can be settled by using force, then we will have destroyed the foundation of the organization and our best hope of establishing a world order"
"Politics ought to be the part-time profession of every citizen who would protect the rights and privileges of free people and who would preserve what is good and fruitful in our national heritage"
"Pull the string, and it will follow wherever you wish. Push it, and it will go nowhere at all"
"I hate war as only a soldier who has lived it can, only as one who has seen its brutality, its futility, its stupidity"
"I have found out in later years that we were very poor, but the glory of America is that we didn't know it then"
"I have one yardstick by which I test every major problem - and that yardstick is: Is it good for America?" "I have only one yardstick by which I test every major problem - and that yardstick is: Is it good for America?" "I like to believe that people in the long run are going to do more to promote peace than our governments. Indeed, I think that people want peace so much that one of these days governments had better get out of the way and let them have it"
"I shall make that trip. I shall go to Korea"
"I think that people want peace so much that one of these days government had better get out of their way and let them have it"
"I thought it completely absurd to mention my name in the same breath as the presidency"
"I would rather try to persuade a man to go along, because once I have persuaded him, he will stick. If I scare him, he will stay just as long as he is scared, and then he is gone"
"I'm saving that rocker for the day when I feel as old as I really am"
"May we never confuse honest dissent with disloyal subversion"
"Motivation is the art of getting people to do what you want them to do because they want to do it"
"Neither a wise man nor a brave man lies down on the tracks of history to wait for the train of the future to run over him"
"No one should ever sit in this office over 70 years old, and that I know"
"Oh, that lovely title, ex-president"
"Only Americans can hurt America"
"Only our individual faith in freedom can keep us free"
"Only strength can cooperate. Weakness can only beg"
"Our forces saved the remnants of the Jewish people of Europe for a new life and a new hope in the reborn land of Israel. Along with all men of good will, I salute the young state and wish it well"
"Our pleasures were simple - they included survival"
"The clearest way to show what the rule of law means to us in everyday life is to recall what has happened when there is no rule of law"
"The free world must not prove itself worthy of its own past"
"The history of free men is never really written by chance but by choice; their choice!" "The most terrible job in warfare is to be a second lieutenant leading a platoon when you are on the battlefield"
"The older I get the more wisdom I find in the ancient rule of taking first things first. A process which often reduces the most complex human problem to a manageable proportion"
"The people of the world genuinely want peace. Some day the leaders of the world are going to have to give in and give, it to them"
"The problem in defense is how far you can go without destroying from within what you are trying to defend from without"
"The purpose is clear. It is safety with solvency. The country is entitled to both"
"The sergeant is the Army"
"The spirit of man is more important than mere physical strength, and the spiritual fiber of a nation than its wealth"
"Things have never been more like the way they are today in history"
"This desk of mine is one at which a man may die, but from which he cannot resign"
"This world of ours... must avoid becoming a community of dreadful fear and hate, and be, instead, a proud confederation of mutual trust and respect"
"Though force can protect in emergency, only justice, fairness, consideration and cooperation can finally lead men to the dawn of eternal peace"
"Together we must learn how to compose differences, not with arms, but with intellect and decent purpose"
"Unlike presidential administrations, problems rarely have terminal dates"
"We are going to have peace even if we have to fight for it"
"We are tired of aristocratic explanations in Harvard words"
"We must guard against the acquisition of unwarranted influence, whether sought or unsought, by the military-industrial complex"
"You have a row of dominoes set up; you knock over the first one, and what will happen to the last one is that it will go over very quickly"
"An atheist is a man who watches a Notre Dame - Southern Methodist University game and doesn't care who wins"
"An intellectual is a man who takes more words than necessary to tell more than he knows"
"Ankles are nearly always neat and good-looking, but knees are nearly always not"
"Any man who wants to be president is either an egomaniac or crazy"
"Disarmament, with mutual honor and confidence, is a continuing imperative"
"Don't join the book burners. Do not think you are going to conceal thoughts by concealing evidence that they ever existed"
"Don't think you are going to conceal thoughts by concealing evidence that they ever existed"
"Every gun that is made, every warship launched, every rocket fired, signifies in the final sense a theft from those who hunger and are not fed, those who are cold and are not clothed"
"Farming looks mighty easy when your plow is a pencil and you're a thousand miles from the corn field"
"Few women, I fear, have had such reason as I have to think the long sad years of youth were worth living for the sake of middle age"
"Here in America we are descended in blood and in spirit from revolutionists and rebels - men and women who dare to dissent from accepted doctrine. As their heirs, may we never confuse honest dissent with disloyal subversion"
"History does not long entrust the care of freedom to the weak or the timid"
"How far you can go without destroying from within what you are trying to defend from without?" "Humility must always be the portion of any man who receives acclaim earned in the blood of his followers and the sacrifices of his friends"
"I can think of nothing more boring for the American people than to have to sit in their living rooms for a whole half hour looking at my face on their television screens"
"I deplore the need or the use of troops anywhere to get American citizens to obey the orders of constituted courts"
"I despise people who go to the gutter on either the right or the left and hurl rocks at those in the center"
"I feel impelled to speak today in a language that in a sense is new-one which I, who have spent so much of my life in the military profession, would have preferred never to use. That new language is the language of atomic warfare"